'We are monitoring the situation and are obliged to be in a constant state of readiness,' said Cypriot Defence Minister Savvas Angelidis. 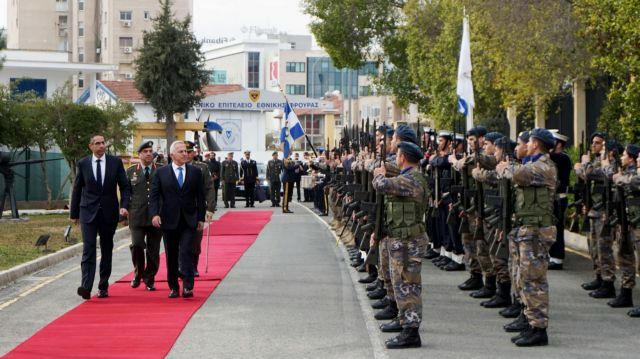 In his first trip abroad as defence minister, Admiral Evangelos Apostolakis held talks in Nicosia today with his Cypriot counterpart Savvas Angelidis amidst heightened Turkish threats over Cyprus’ offshore gas drilling programme in its own Exclusive Economic Zone (EEZ). Apostolakis said that the two countries’ longstanding defence cooperation is constantly increasing, and that from now on it will be much more effective. For his part, Angelidis said that although Turkey is threatening Cyprus with the use of force, engaging in extremely provocative actions, and disputing the country’s sovereign rights, Nicosia will not follow suit. “We are monitoring the situation and are obliged to be in a constant state of readiness,” Angelidis said. The Cypriot defence minister underlined that Greece is standing by Cyprus constantly and that Nicosia is grateful for that perpetual support “until the (Cyprus) problem is solved and illegal (Turkish occupation) troops leave”. Apostolakis and Angelidis are traveling together to Bucharest for an informal meeting of EU defence ministers that is taking place today and tomorrow, 31 January. Apostolakis’ office has confirmed that he has been invited to visit Turkey by his Turkish counterpart, Hulusi Akar. Both men served as their countries’ chairman of the joint chiefs of staff immediately before being appointed defence minister, and they have a longstanding relationship. The invitation was issued in Akar’s letter to Apostolakis to congratulate him upon his recent appointment as defence minister. Turkey’s state-run Anadolu ran the story with the title “ ‘Surprise’ invitation from Defence Secretary Akar”.